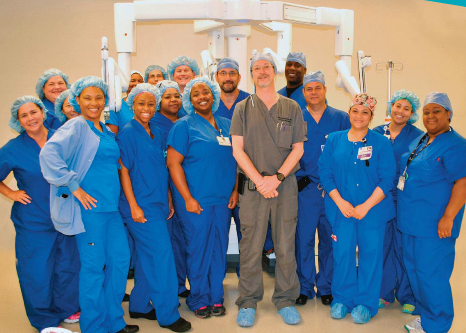 On July 23rd, CHI St. Luke’s Health – Sugar Land Hospital became the first hospital in the Houston area to use the newest and most advanced Intuitive da Vinci Xi Surgical System. In fact, St. Luke’s is the fifth hospital in the world to be using the latest robotic surgical system. The new system offers three dimensional high definition visualizations and allows for the enhanced dexterity and greater precision and control for the surgeon. Two of our top Surgical Professionals were there for the grand opening! For more details, read the official press release here.